Fruit Stem Cell Science™ improves follicle longevity and vitality for healthy hair from root to tip. This medium-hold formula with restorative proteins gently fortifies and conditions strands for flexible styling. 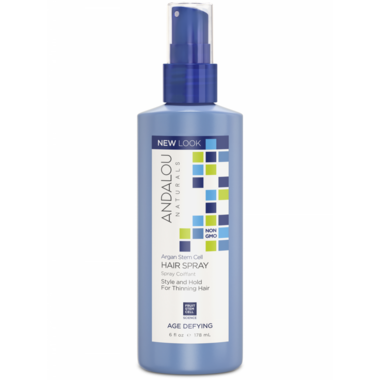 Controls static and shields against humidity, frizz, and fly-aways. Benefits: Thinning Hair. Adds Style and Hold. Features: Made naturally with certified organic, Non-GMO Project verified, and Fair Trade ingredients. Vegan, eco-friendly, and cruelty-free. I really enjoy this product! Holds well and I love that it's a pump spray, as it's easier to recycle. I was worried I won't find a natural hairspray to keep all day hold, I was wrong. I have short hair and style it "messy" and it holds strong all day long. It does have a stiff hold but that's what I am used to. I would definitely purchase again. This is great for a light hold or for an extra volume boost, and I LOVE that it's a natural product. I can feel good about using it. Does really hold my hair in place! Nice, light scent, but dries a tiny bit on the "crunchy 80's bar-hair" side. Perhaps Iam using a tad too much! Really good natural hairspray - smells nice (like salon items) and is a strong hold.